This page reports on a recent find, a copy of a hitherto unknown London sheet music print Currency Lasses, an admired Australian quadrille, composed by a lady at Sydney, and perform'd there with great success by the Bands of the 3rd (or Buffs), 39th and 57th Regiments. Strong circumstantial evidence presented below points to the music dating from c.1825, and links it and the likely "lady" composer, Tempest Margaret Paul, with Thomas Kavanagh, master of the Buffs' Band, and suggests that in this printed scoring for piano the work is very probably a version of the Currency Lasses advertised by Kavanagh in his noted lost collection of Original Australian Music in January 1826. After her appearances in the pioneering Sydney Amateur Concerts in 1826 (in which Kavanagh was also a leading participant), during which she notably performed Arne's soprano bravura The Soldier Tir'd, and gave the first Australian public performance of a recent London hit, Bishop's Home, sweet home, Paul was duly described in one newspaper as "the Catalani of Australia". Complete documentation of early musical references to Currency lasses is presented, including the positive identification in 1836 of Paul as being the composer of a work of that name. Full biographical documentation is also registered on Paul and her musical family, including two sons who also participated in the organisation and performance of the 1826 concert series, and a daughter who came later to Sydney. In mid-December 2015, I was invited to inspect a large and very fine collection of bound volumes of late 18th- and 19th-century sheet music. Several of the volumes included a significant proportion of Australian prints, including a copy of one of Francis Ellard's first Sydney prints - of The Lancers' Quadrilles - dating from 1839. While many of the volumes were in 19th-century bindings (collections of loose sheet music that their original owners had professionally bound), at least one had been bound in the late 20th-century by the Woollahra antique dealer Bill Bradshaw (1922-2009), out of items of sheet music he had collected separately. One item in particular was of extraordinary interest. 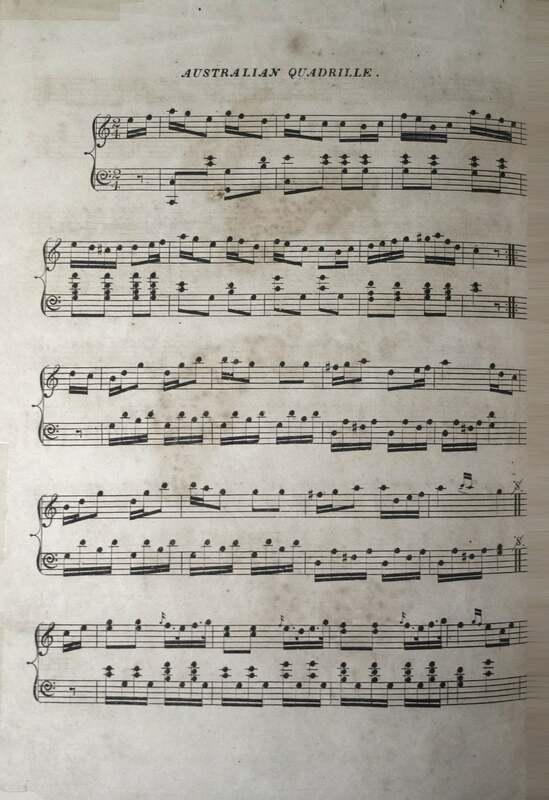 An apparently now unique copy of a previously unknown English print of an Australian musical composition of c.1825-26, it now becomes the earliest piece of Australian instrumental music to survive. The copy is quite tightly bound and has been trimmed slightly at the top and bottom, but probably originally measured the standard music folio size of 32-33cm x 24-25cm. There are four pages on 2 folios (probably a single sheet folded) of heavy (? un-watermarked) paper. 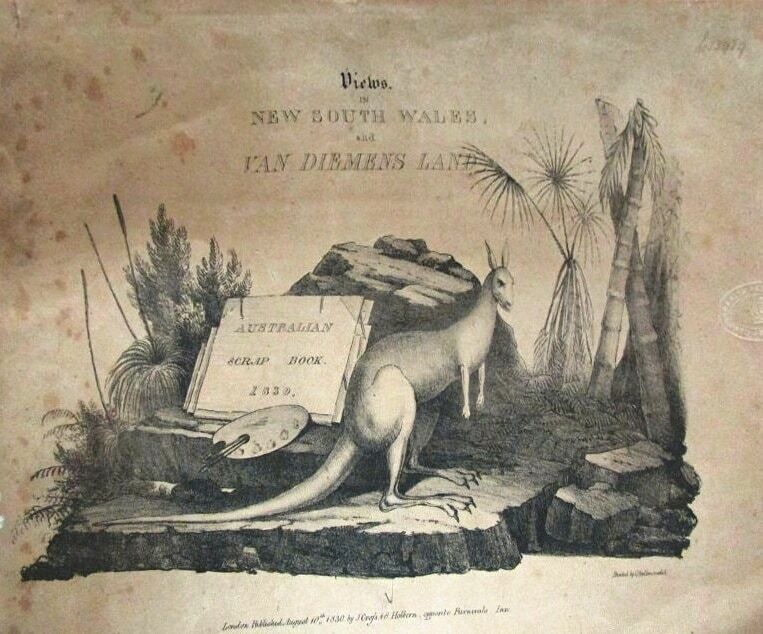 The titlepage with an illustration of a kangaroo beside the motto "Advance Australia", and a collection of tools of visual (brushes and palette with paints) and musical artists (a pipe and a sheet of music). Pages 2 and 3 are printed with music, and page 4 (the verso of the second folio) is blank. The lithography and printing are clean and crisp, the paper is good, and the pages well-preserved (apart from a few later stains, tears and rubbings). There are two inscriptions, probably names of earlier owners, at the top right of the title page, both heavily cropped, but no other manuscript additions. If for no other reason, the print is of considerable interest as another lithograph entirely produced - "Engraved, Printed & Published" - by the early 19th-century London engraver and bookseller Joseph Cross, of Holborn. From the mid-1820s and through the 1830s, Smith developed a special list of maps and books relating to the British colonies, Australia included, but seems not otherwise to have interested himself in musical publishing. I have (as of January 2016) not identified any musical issues by him advertised at the time or in the bibliographic record, nor found any advertisements in the English or Australian press for this work. Though an unusual publication for Cross, he took full responsibility on the titlepage for publication (rather than "for the author"), and there is no dedication. The stronger likelihood is that he published it as a paid commission; less likely perhaps, but worth considering, perhaps he himself produced and paid for the work as a gift to the "lady" composer. Cross operated out of his shop at the address given on the titlepage - 18 Holborn - from as early as 1826, and throughout the 1830s and 1840s, several times during this period specifically advertising his colonial imprints. Of those relating to Australasia, Ferguson lists 7 editions from in his first volume (1784-1830), including works by former or present NSW colonists James Atkinson (1826) and Henry Dangar (1828), and (485, no 1342) an edition of Augustus Earle's Views in New South Wales and Van Diemen's Land. Australian Scrap Book (London: Published, August 10th, 1830, by J. Cross, 18 Holborn, opposite Furnivals Inn), whose titlepage also features, according to Ferguson, "Australian Scenery and Kangaroo". 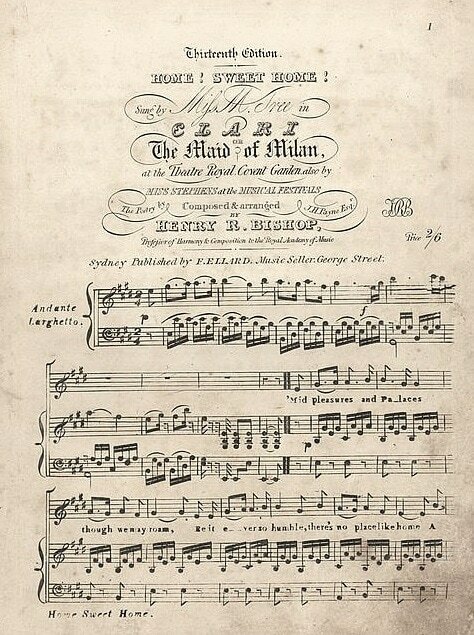 While the image on the title sheet of the 1830 Cross edition of the Earle is not the same as that on the cover of the music sheet, as can be seen below, the latter would appear to be more than just loosely based upon it. That a tune called Currency Lasses was circulating in New South Wales is well-attested from late 1825 through to the late 1830s (see below). Quite a few recent commentators, myself included, have wondered whether it was originally a song, perhaps somehow connected with the 1832 song, Australian courtship, which perhaps even shared the same tune. The 1832 song notwithstanding, however, there are no explicit references to Currency lasses being sung. It was first positively mentioned as a toast tune ("Air - Currency Lasses"), played by the Band of the 3rd Regiment (Buffs) to a toast proposed by the colony's leading "Currency Lad", W. C. Wentworth, at a public dinner for the outgoing governor, Thomas Brisbane, at Nash's Inn, Parramatta, on Monday 7 November 1825. This band, under its master Thomas Kavanagh, is also the first listed as having played the quadrille Currency Lasses (above). One earlier newspaper report of the Anniversary Dinner in January 1825 refers to each of the toasts, including one to the "Currency Lasses", being "followed with an appropriate air" played by the "band of music" in attendance (again, the Band of the 3rd Regiment). Two months after the Brisbane dinner, on 5 January 1826, Thomas Kavanagh first advertised copies (presumably manuscript) of his much cited lost collection of "Original Australian music". Seven of the 11 titles relate to the outgoing and incoming governors, Brisbane and Ralph Darling, their wives, and the colonel of the Buffs, and appear to have been specially composed to be played by his own band at the various military parades and other functions (balls and dinners) held during the concurrent vice-regal welcomes and farewells. Though Kavanagh claimed he "composed" all the pieces, one - a "Scotch air" My native distant home - was perhaps an arrangement. Kavanagh did not stipulate instrumentations, and may have intended to supply general inquirer's with tailormade arrangements, for instance, for piano, melody instrument (flute or violin), or both. The "Scotch air" notwithstanding, his own bravura piece The trumpet sounds Australia's fame (performed by him later that year during the Sydney Amateur Concerts) is the only piece specifically designated "song", suggesting that Currency lasses was also an instrumental piece. Kavanagh himself may well have composed the piece he lists called Currency Lasses. 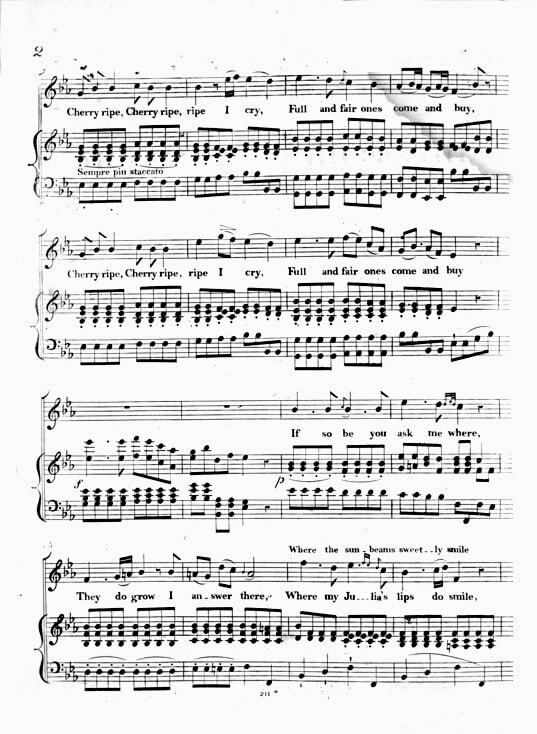 However, the discovery of this quadrille and the circumstantial evidence surrounding it, suggests to me that there was just one instrumental piece called Currency lasses played by the band of the Buffs, and that some or all of it probably originated in an early version of this piano piece by "a lady", and was reworked and perhaps improved upon and amplified by Kavanagh in various arrangements for band, probably in both military wind octet and social-mixed ensemble (quintets or sextets of strings and winds) formations. A toast air "Currency lasses" was again played by Kavanagh's Band at the public Anniversary Dinner in 1826, and his band may well have been the unnamed ensemble that played it again at the same event in 1827. If so, it was his band's last social appearance, as the Buffs embarked for India the following day. Thereafter, the Band of the 57th Regiment, under its master George Sippe, was for some months Sydney's only military music ensemble, until it was joined by Band of the 39th Regiment, under its master Francis Gee, which first landed in Sydney in September 1827. These two bands, named along with the Buffs' on the titlepage above, continued to serve in Sydney (sometimes both playing, together or separately, at the same function), until they too left for India, in 1831 and 1832 respectively. 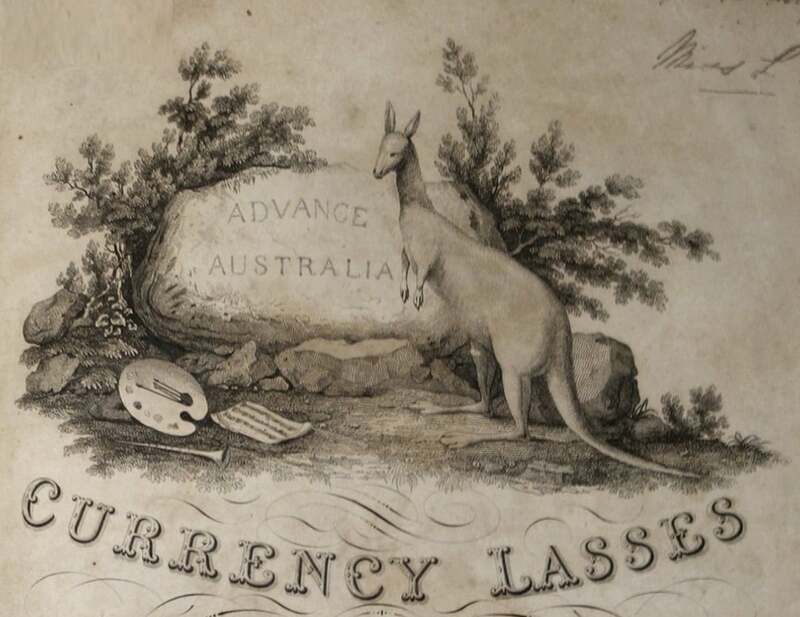 There is no reason to doubt the claim on the titlepage that the Currency Lasses quadrille was played by both of them, and indeed there is a record of the Band of the 39th doing so ("Tune - Currency Lass" [sic]) at the Anniversary Dinner of the Australian Society in January 1831. Thereafter, there are records of a toast tune Currency Lasses also being played during the public Anniversary Dinner in 1837 by the Band of the 4th Regiment, under its master George Coleman (stationed in Parramatta and Sydney from 1832 to 1839). Accordingly, it may be significant to the dating of the print that neither it nor any other bands stationed in Sydney after 1832 are mentioned on the titlepage. On the basis of the list of three bands, the music of our lady's quadrille was in existence perhaps as early as 1825 and almost certainly during 1826, performed by the Band of the 3rd, and thereafter taken up by the 39th and 47th. In addition to the newspaper references, Peter Cunningham specifically mentioned the toast and tune in his 1827 book. The Currency lads" is now a popular standing toast, since it was given by Major Goulburn at the Agricultural dinner, while "The Currency lasses" gives name to one of our most favourite tunes . . . He ended that performance with "Currency Lasses" (as composed by our talented towns lady, Mrs. John Paul senior,) adding to it some extemporaneous variations [ - ] many ladies and gentlemen were to be seen with scraps of music in their hands ready to present them, but being so well satisfied, no doubt did not wish to trouble him. Was this the same Currency lasses played by the bands and printed in London for our lady? Some biographical evidence may be helpful. Tempest Margaret Paul, the wife of the merchant John Paul, was the leading female amateur singer on several programs in the colony's inaugural subscription concert season, the Sydney Amateur Concerts, held from June 1826 to January 1827. As well as singing in duets and glees, she was also soprano soloist, accompanying herself on the piano, most notably in Arne's bravura The soldier tir'd, and in the first Australian public performances of that only relatively recent London hit, Home, sweet home. Her two sons also participated in the concerts, both as committee members and performers, John as a tenor (viola) player in the orchestra, and George as a vocalist in several comic songs. Kavanagh and Sippe, the band masters of the 3rd and 57th, were among several key professionals involved in the organisation of the series, providing members of their bands for orchestral and vocal items, and themselves appearing as soloists and - in one instance each - also as composers. Further proof of the musical connection between Kavanagh and Tempest Paul, in June 1826 five of the Buffs' Band (himself likely among them) played for a private concert and ball Paul held in her new house in George Street. Probably most if not all of the the five band members played strings, and in the circumstances the Currency Lasses quadrille (assuming it was already in their repertoire) would almost certainly have been performed. Unfortunately, unlike the lists of toast tunes regularly reported in the press, no dance lists of musical numbers survive from this early colonial period. But documentation shows that quadrilles were a well in vogue in Sydney balls at the time. A good number of the rising generation of "Currency lasses" would have been invited to the Pauls' ball (the daughters of John Piper, known to have close business connections with Paul, perhaps among them). Tempest Paul might also have had in mind the recent accession to her own family of two infant currency lasses, her grand-daughters Tempest Jane and Margaret Isabella Paul.
. . . one of the few advantages of races, balls, theatres, concerts, &c. is, they bring the aristocracy and the common people together they tend to abate the haughtiness of rank, while the poor are made to feel themselves to be somebody in the State; and that feeling generates in them a veneration for their superiors, while they see them once a year con descend as it were to a species of equality. Early in 1828, Tempest Paul and her husband left their Sydney business in the hands of their sons and sailed back to England. They returned to Sydney in August 1831, and stayed on for a second prolonged period until March 1837. The last of the bands mentioned on the titlepage of the quadrille, the 39th, arrived in Sydney in September 1827, four or five months before the Pauls left for England, and was still here when they returned in 1831. Allowing four or five months for the music to be sent by sea to England after the arrival of the 39th in September 1827, the earliest possible date of printing would have been January or February 1828. And, if the absence of the 4th from the list of bands on the titlepage means anything, then the latest date is perhaps not much later than 1833, by which time that band was well ensconced in Sydney. Moreover, since Tempest Paul was herself back in London between late 1828 and early 1831, it is likely that she - if she is indeed the composer - either had the music printed while she was in England, or arranged to have it printed after her return to Sydney. Kavanagh and Tempest Paul are the two strongest (and only two named) contenders for authorship of Currency lasses. Their close association in the 1826 amateur concerts, and in Paul's private ball, suggests that it was a collaboration. Paul may, for instance, have originally composed and set for piano one, two, or all of the tunes (there are 3 distinct melodies), and commissioned Kavanagh to add to and otherwise improve and amplify her original, and arrange and perform it as a functional dance quadrille, scored for the sort of small mixed ensemble that regimental bands regularly supplied to play for dancing at for balls and for toast tunes at dinners (a couple of violins and cello, perhaps a viola, flute, or clarinet). It seems most likely that Paul arranged to have the music engraved and printed while she was back in England in 1829 or 1830. Almost certainly the printed version was in existence well before Vincent Wallace arrived in Sydney in 1836, and, in the circumstances, it was probably the print that Paul submitted to him at his concert. While the positive identification of this manifestions of Currency Lasses with those documented elsewhere cannot yet, and perhaps will never, be proved to complete satisfaction, the circumstantial evidence is strong. In closing for the moment (and I will continue to update and add to this page as further information comes to light), we might also ask whether this "Australian quadrille", the first and only to survive, was composed in emulation of the lost set of Australian Quadrilles advertised by Joseph Reichenberg, bandmaster of the 40th Regiment, in Sydney in April 1825. 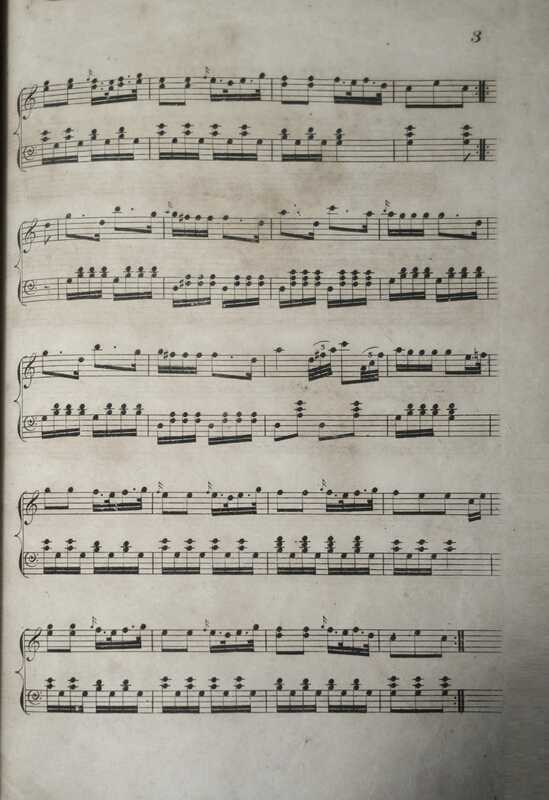 If it was, that would further strengthen the dating of the composition of this earliest surviving piece of original music by an Australian colonist, to the second half of 1825. 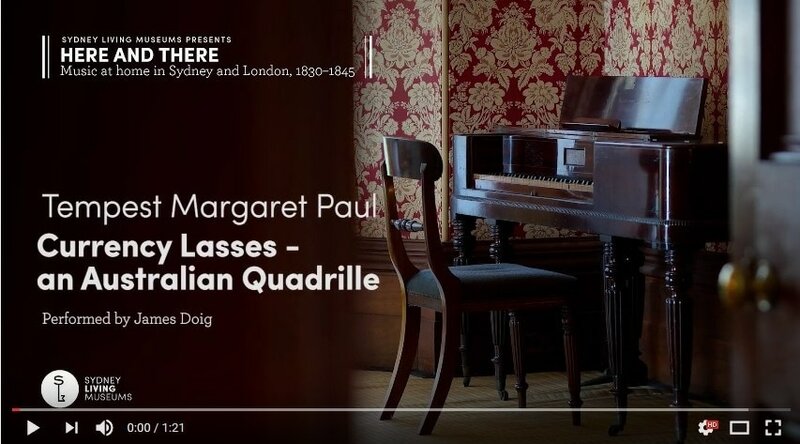 In any case, this "Australian Quadrille" well predates both Ellard's Australian Quadrilles of 1835, and William Cavendish's recently discovered manuscript quadrilles of 1833. By the standards of the modern classical canon, it is by no means a great or even a remarkably well put together piece of music. After a promising opening couple of bars, the chordal accompaniment in the left hand is not as fully worked out or well voiced as it could have been. But its merry circulation of simple, direct melodies withstands comparison with such only slightly earlier popular British sets as Hart's famous Lancers Quadrilles (published first in Dublin in 1817), probably already well known in Sydney at the time (see Ellard's lithographic print of c.1840 taken from a British edition of the early 1820s).
. . . a highly respectable first surviving example of genuinely "Australian" settler music, and composed by a "lady" to boot! Yesterday the head quarters of the 39th Regiment disembarked from the Cambridge, under the orders of Lieutenant Colonel Lindsay. The detachment was welcomed on shore by a considerable number of brother officers and friends, who proceeded with them to their quartets in the Military Barrack; the band of the Regiment continuing to play all the way through the town. Ferguson 1975 (Bibliography of Australia, volume 1), 389 (1054), 434 (1184), 460-61 (1270-1), 473 (1307), 485 (1342), 486 (1346). The Duke of York and the Army. The Duke of Clarence and the Navy. The memory of Governor Philip, the founder of the Colony. The memory of Major General Macquarie, our late revered and lamented Governor. Sir James Macintosh, and the other Advocates of Australia in the British Senate - three times three. Trial by Jury - three times three. A House of Assembly - three times three. The freedom of the Press - three times three. The Agriculture & Commerce of the Colony - three times three. The Currency Lasses - three times three. Prosperity and independence to the rising Generation - three times three. Mrs. Macquarie and our fellow-countryman, Lachlan - three times three. The health of the Stewards. There was a band of music in attendance and each of the above toasts was followed with an appropriate air . . .
. . . The band of the fortieth regaled the company with music, after Mrs. Hill had regaled them with a good dinner. Good humour existed in perfection. When the cloth was removed, St. George, as might be expected, received every attention: the mention of his name was hailed with enthusiasm; and an elder and very important branch of his Saintship's family was duly honored in the glass; the band striking up an appropriate air. The King was drank in proper style; then followed the usual public toasts. The "Currency Lasses" were bumpered three times three, as we hope they always will be . . .
Sir, Amongst the numerous festivities of the race week, you have omitted to notice a ball given by Mr. and Mrs. R. Cooper to a large party of their friends, on the evening of Tuesday the 26th ult. . . . It was truly gratifying to behold in this remote quarter of the globe, so large an assemblage as forty charming, well dressed women, most of them "currency lasses," whose ease and elegance would not disgrace the most fashionable European assemblies; and who, I have no doubt, will be much pleased on seeing their evening amusement recorded in the columns of "The Australian." I remain yours, &c. A SPECTATOR. May 2, 1825.
. . . Mr. W. C. Wentworth returned thanks; he could not but be proud of the relationship in which he stood towards the individual whose health had been just drank [D'Arcy Wentworth], but even if that relationship did not exist, he should be proud that the Community possessed such a man, than whom a more upright and zealous friend of liberty did not exist ; and he deeply regretted that the state of his health should have prevented him filling a situation that evening, to which he would have done honour. Air. - Currency Lasses. Dedicated by permission to his Excellency Sir Thomas Brisbane, K. C. B. &c. &c. and by permission of his Honor the Lieutenant Governor. MR. KAVANAGH, Master of the Band of the 3rd Regiment, begs leave to acquaint the Gentry of Sydney and its environs, that he has lately composed the following pieces, which are now submitted, at his quarters in the Military Barrack, where copies may be had. General Ralph Darling's Australian slow march. His Honor Colonel Stewart's slow march. Sir Thomas Brisbane's grand Australian march. Sir Thomas Brisbane's grand Australian quick march. My native distant home - Scotch air. The trumpet sounds Australia's fame - song. Mr. K in submitting to the Australian public, this specimen of national music, trusts he will meet with that encouragement he will be always studious to merit. Thursday last, being the Anniversary of Australia's Establishment as a British Colony, the same was observed with the usual demonstrations of remembrance. In the morning the Royal Standard, as well as the Union, was displayed at Dawes' Point; and at noon a salute of 38 guns, corresponding with the number of years the Colony has been founded, was fired from Dawes' Battery, in honour of the day. The King, three times three - Air, God save the King. The Duke of York and the Army - Duke of York's March. The Duke of Clarence and the Navy - Rule Britannia. The Duke of Sussex, and the rest of the Royal Family - The Royal Branch. The health of our present Governor, Lieutenant General Darling, three times three - General Darling's March.
. . . the health of our late Governor, Sir Thomas Brisbane . . . - Sir Thomas Brisbane's March. The Memory of our late revered Governor, Major General Macquarie . . . - Scots wha' hae. The Memory of Governor Philip, the Founder of the Colony . . . - Hail, Australia! Trial by Jury . . . Air, Tyrolese Song of Liberty. A House of Assembly for Australia - Air, Sir James Macintosh's Reel. The Liberty of the Press. - Air, Sir Thomas Brisbane's Quick March. The Currency lasses and Lads. - Air, Currency Lasses. Success to the Fleece and the Plough. - Air, Speed the Plough. The Trade and Commerce of New South Wales. - Air, Hearts of Oak. THE AGRICULTURAL AND HORTICULTURAL SOCIETY. Such is the new designation of the above Institution. The Annual Meeting took place at Nash's Rooms, Parramatta, on Thursday last, pursuant to public Advertisement. The President (Sir John Jamison), and a goodly number of Members, were present at an early hour . . . In the evening about forty Gentlemen sat down to a dinner that had been prepared by Nash for the occasion . . . The President was in the Chair, and Captain Piper was Vice. Some of the bon vivants pronounced the wines as particularly excellent; and one or two Gentlemen were at great pains in manifesting their approbation of the champaigne, by the constant circulation of the glass, which seemed to invigorate them with new life, and we only consider this allowable upon the plea set up, that such copious libations would most effectually tend to "advance Australia." A great number of toasts were given, many of which were drank with enthusiasm, "The King" - "Duke of York and the Army" - "Duke of Clarence and the Navy" - "Governor Darling, the Patron of the Institution" "Mrs. Darling, the Ladies of the Colony, and the Currency Lasses" . . . - "The Currency Lads" . . . "Captain Piper, and the Commercial Interests of New South Wales" . . . Messrs. T. H. James, Maziere, Robertson, &. & entertained the Company with several choice songs. The King - Air, God save the King. Duke of York and the Army - Duke of York's March. Duke of Clarence and the Navy - Rule Britannia. The Governor - British Grenadiers. The Memory of Governor Philip, the Founder of the Colony - Rosslyn Castle. The Memory of Major General Macquarie, the Father of Australia - Auld Lang Syne. Sir Thomas Brisbane - There's nae luck. Trial by Jury - Britons strike Home. Taxation by Representation - Hearts of Oak. 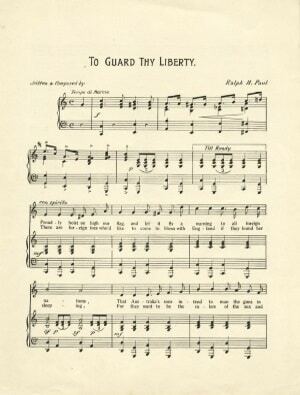 The Freedom of the Press, the greatest Blessing to Mankind - Tyrolese Song of Liberty. The Cause of Civil and Religious Liberty all over the World - Scot's wha hae. The rising Generation of the Colony - Currency Lasses. The Agricultural and Commercial Interests of New South Wales - Speed the Plough. The Sheriff. W. C. Wentworth, Esq. and Sir John Jamison, the Mover and Seconder of the Petition. The Ladies of the Colony. Howe, Wardell, and Hall, the independent Advocates of the Free Press of the Colony. The Memory of Mr. Michael Robinson, the Poet Laureate of the Colony. Currency, or colonial-born population. Our colonial born brethren are best known here by the name of Currency, in contradistinction to Sterling, or those born in the mother country. The name was originally given by a facetious paymaster of the seventy-third regiment quartered here, - the pound currency being at that time inferior to the pound sterling. Our Currency lads and lasses are a fine interesting race, and do honour to the country whence they originated. The name is a sufficient passport to esteem with all the well-informed and right-feeling portion of our population; but it is most laughable to see the capers some of our drunken old Sterling madonnas will occasionally cut over their Currency adversaries in a quarrel. It is then, "You saucy baggage, how dare you set up your Currency crest at me? I am Sterling, and that I'll let you know!" . . . They [The Currencies] grow up tall and slender, like the Americans, and are generally remarkable for that Gothic peculiarity of fair hair and blue eyes which has been noticed by other writers. Their complexions, when young, are of a reddish sallow, and they are for the most part easily distinguishable - even in more advanced years - from those born in England. Cherry cheeks are not accompaniments of our climate, any more than that of America, where a blooming complexion will speedily draw upon you the observation, "You are from the old country, I see!" The young females generally lose their teeth early, like the Americans and West Indians, - this calamity always commencing about the period of puberty: it may possibly be ascribed to the climatising process, as we see nearly all plants and animals suffer considerable change in appearance on transplantation to a different latitude: we may therefore hope this defect will subside when a few generations have passed away. "The Currency lads" is now a popular standing toast, since it was given by Major Goulburn at the Agricultural dinner, while "The Currency lasses" gives name to one of our most favourite tunes . . .
AUSTRALIAN SOCIETY. THE members and friends of this Society dined together, on Wednesday last, at the Crown and Anchor Tavern, SAMUEL TERRY, Esq. in the Chair; DANIEL COOPER, Esq. Vice-president. About one hundred and thirty persons were present . . . After the cloth was removed, the following toasts were given by the President: . . . Currency Lads and Currency Lasses - [Air] Currency Lass [sic] . . .
PUBLIC DINNER. The Members of the Australian Society for the encouragement of Colonial Manufactures, to the number of between 130 and 140 including their friends, sat down to an excellent dinner, on Tuesday last, at Hart's Hotel, Pitt-street. A portion of the band of H. M. 39th Regiment was kindly permitted by Colonel Lindesay to attend. On the cloth being removed, the Chairman (Mr. Samuel Terry), ably supported by Mr. Simeon Lord as Vice, proposed the following toasts, which were greeted by appropriate tunes from the Orchestra: - . . . "Currency Lads and Currency Lasses." Tune - Currency Lass . . . The band of the 39th Regiment was in attendance, and played several appropriate tunes in their usual style of excellence. Major POOLE presided; and we have seldom witnessed a chair more ably filled . . .
. . . The Chairman next proposed the health of the "Sons of Australia." Air - Currency Lad.
. . . The Chairman next proposed "the Currency Lasses." Mr. Innes returned thanks. He felt called upon to do so from the happiness he enjoyed in having "linked his destiny" with a daughter of Australia (much cheering).
. . . Few of your readers, I suppose, are aware that Dr. Southey, the Poet Laureate of England, published a series of poems, a great many years ago, under the title of "Botany Bay Eclogues." One may easily imagine what sort of pieces such poems were likely to be-representations, forsooth, of our lifers and fourteen-years-men sitting on the rocks that overhang the blue waters of the Pacific, and mingling their salt tears with the ocean brine, or soliloquizing the kangaroos and the blue gum-trees in the forests of the interior, on the miseries of their exile. The worthy Laureate knew very little of "Life in New South Wales," of which, Doctor, I propose to send you a few specimens in a series of "Genuine Botany Bay Eclogues," which, however inferior in poetical merit, will, nevertheless, I doubt not, be greatly superior, in truth of colouring, to his transmarine effusions. GENUINE BOTANY BAY ECLOGUES, No. I. An excellent new Song, as it ought to be sung in the Theatre Royal, Sydney, by Mr. B - t L - y, in the character of the Ticket-of-Leave Holder. Is a lass in the Female Factory. But the Judge was bribed and so were the Jury. His father was turnkey of Newry jail. Says I, "I'll marry you now in an hour,"
Says she, "Well, go and fetch Father P - r."
But I got into trouble that very same night! And was put in the watch-house and then in the stocks. 0! sure, and it's no place at all for a lover! "It's worse than the tread-mill," says I, "Mr. Dunn,"
"To sit here all day in the hate of the sun!" But if I had a dollar I'd drink it with Molly. "O! Won't you let Molly out very soon?" "Is it not?" says I, for she know'd it was she. For beating her mistress, Mrs. Cox?" "O ! now let me in, madam, I am her brother." Is a lass in the Female Factory . . .
. . . He ended that performance with "Currency Lasses" (as composed by our talented towns lady, Mrs. John Paul senior,) adding to it some extemporaneous variations [ - ] many ladies and gentlemen were to be seen with scraps of music in their hands ready to present them, but being so well satisfied, no doubt did not wish to trouble him . . .
About one hundred and seventy natives of the Colony dined together, yesterday, at the Royal Hotel, for the purpose of celebrating the Anniversary of the foundation of the colony . . . The following is the order in which the Toasts were given. 1. The King - Royal Anthem. 2. The Queen - Adelaide Waltz. 3. 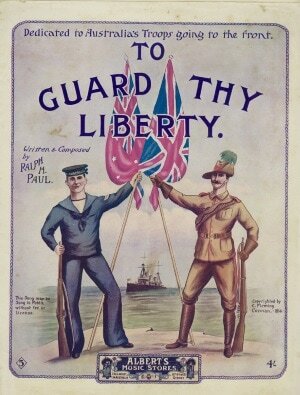 The British Navy - Rule Britannia. 4. The British Army - British Grenadiers. 5. His Excellency the Governor - Garry Owen. 6. The Memory of General Macquarie - To be drank in solemn silence. 7. Our Fair Countrywomen - Currency Lasses . . . The first Australian commemoration of the anniversary of the foundation of the Colony, took place on Thursday evening, at the Royal Hotel, where upwards of two hundred Gentlemen, Natives of the Colony, sat down to an entertainment of the most sumptuous description, and the liberality and good taste displayed by the Stewards, on the occasion, was ouch as to call forth the warmest encomiums from their fellow countrymen. The dinner was served up on three tables, each the length of the Saloon, the head of the centre table being taken by the President, Charles Tompson, Esq.. of Penrith, that on the right of tlie President by - .Lowe, Esq., and that on the left by John Piper, jun., Esq., of Bathurst. On the removal of the cloth, the Band played Non Nobis Domine. After which the President proceeded to propose the Toasts, the first being, of course, "The King" - which was drank with three times three, followed by rounds of rapturous applause; Air, The National Anthem. Then followed in succession . . . "Our fair country women" - Air, Currency Lasses . . .
. . . The health of the Lady Mayoress [Martha Hosking] was then drank with all the honours, the band [of the 80th Regiment] playing "Currency Lasses." [Linley family] In the will dated 1821, of William Simon Hughes otherwise Simon Hughes, butler to Sir John Hill of Hawkstone in the parish of Hodnett, Shropshire in Hawkstone, Hodnet, Shropshire, Tempest Margaret Paul named as executrix; also mentions her husband John and grandsons George and John Paul and granddaughter Tempest Paul. HOBART TOWN. Dec. 22. - SHIP NEWS. - On Monday morning last [16 December 1821] arrived from England . . . the ship Minstrel, Captain Barns, with merchandize and passengers; namely . . . Mr. Waddingham, Mr. Salmon, Mr. Paul, and Mr. Clift. On Friday [11 January] arrived from England, via Hobart Town, the ship Minstrel, Capt. Barns, having on board a cargo of valuable merchandize. Passengers, Capt. John Smith, of the Bengal Army; Mr. and Mrs. Hawkins, and 7 children; Mrs. Mary Lilley, mother of Mrs. Hawkins; Mr. and Mrs. Duncomb, and 3 children; Mr. Webber, and several others.
. . . Mr. George Paul, to be Deputy Superintendent of Carters' Barracks, with a Yearly Salary of £40, payable from the Police Fund. On Monday last [19 August] arrived the ship William Shand, Captain Kenn, from England direct, in 3 months and 18 days, having left the 1st May. - Passengers, Mr. and Miss Champion, Mr. and Mrs. Bonnor and family, Mr. Duguid, Mr. A. Ross, Mr. and Mrs. Boyd, Mr. and Mrs. Paul and son . . . I trust you will excuse the liberty I have taken in addressing you, but having had the honour of an Interview with you when in England respecting a son of mine, who afterwards came out with letters from Lord Hill - and who I found on my arrival in this Colony which was a fortnight ago, as holding a situation in Carters Barracks - I think? beg to be allowed to return you my sincere thanks for the early provision which was made for him and trust he will ever continue to merit your high favour and patronage. I have another son which with my husband, constitutes the whole of my family. The former is a youth of stout moral caracter [sic], a good scholar, and excellent disposition and should feel highly honoured by your allowing me to introduce him to your notice. I could have had letters from several persons of high Credit in England but did not think it necessary to trouble you with them. I was at Hawkstone for a fortnight previous to my leaving England and have the pleasure to say Sir John Hill, Lord Hill and the whole family were well. I have taken a House in Macquarie Place for a Boarding House to be conducted upon the most respectable plan, and trust by strict attention to merit the patronage of the Most distinguished in this Colony. Apologies for thus intruding on your time, I remain your most obedient and very humble servt Tempest Margaret Paul. I beg leave to state our motive for coming to this colony, was with a view to alleviate the mind of Mr. Paul - who was labouring under great depression of spirits occasioned by the loss of a lovely girl 15 years of age and who was advised to travel. ON SALE, at Mr. PAUL'S, Macquarie-place, several double and single-barrel FOWLING PIECES, of superior workmanship, double and single Holster, and pocket Pistols, Wadding Cutters, Lock Vices, &c. Best Gun Flints, Gold Repeating Watches, Plate, Jewellery, &c. &c. Likewise, a few dozen of capital Black Lead Pencils, by those celebrated makers, Brookman and Langdon, London. MRS. PAUL respectfully informs her Friends and the Public, that she has taken a House in Macquarie-place next door to Mr. Lord's, where Gentlemen and Families may be accommodated with Board and Lodging, and every Attention paid towards their Comfort. THE Governor has been pleased to appoint Mr. John Paul to be an Auctioneer and Vendue Master, in the Town of Sydney. Mr. George William Paul, to be Superintendent of Carters' Barracks, vice Elyard, who retires . . . SALES BY AUCTION . . . BY MR. PAUL, At his Auction Room, George-street, on Monday next, the 26th Instant, at half-past l1 o'Clock, AN Assortment of Piece Goods, comprising shirting, muslins, calicoes, dimity, corduroy, velvet, waistcoating, checks, greatcoats; slops, the "Encyclopedia Perthensis, a threshing machine, ploughs, iron traces, double twisted backhands, and other agricultural implements; sofas, chairs, writing paper, a fine toned patent flute, four silver keys, music books, wearing apparel, and other Property. SALES BY AUCTION. BY MR. PAUL, At his Auction Room, George-street ,on Monday next, at 11 o'clock precisely, THE following Valuable and Useful ARTICLES, the Property of a Gentleman leaving the Colony : - Two brilliant toned, high-finished pianofortes, with the additional keys, mahogany cases, turned leg, pedals, &c by those eminent Makers, Stodart and Rolfe, London; a beautiful and perfect ivory patent flute, with 8 silver key and ferrules, &c. by the celebrated Drouet, and case; a choice collection of printed Music, by the first Masters, vocal and instrumental, in Songs, Duets, Trios, Quartettes, Glees, Quadrilles, &c; superior French brandy, English hams, and a large Collection of other desirable Property. SALES BY AUCTION . . . BY MR. PAUL, On Friday the 1st of April, at 11 o'clock, AN EXCELLENT ASSORTMENT OF MUSICAL INSTRUMENTS; comprising violins, bows, clarionets, flutes of various descriptions, pickrows, violin strings, a quantity of printed music; consisting of instruction books, quadrilles, waltzes, country dances, &c. . . . By Mr Paul. At his Rooms, George-street, on Monday next, at 11 o'clock, A VARIETY OF EXCELLENT MUSICAL INSTRUMENTS; consisting of violins and bows, 6-keyed bugles, clarionets, flutes, with single and extra keys, violin strings. Mr. Paul has lately purchased of Messrs. Icely and Hindson a great part of their valuable importation, per the Columbia: his purchase alone amounts to £12,000. Amongst the profusion of imposing articles, there is a rich display of tasteful and fashionable millinery, and ladies' superb and bewitching dresses. The selection of bronze, pedestal, and Grecian lamps, is quite irresistible. In the Colony we never witnessed so magnificent an exhibition of astonishingly grand and valuable rarities. The temptation to rob Mr. Paul's new rooms of their unparalleled splendour is impossible to be overcome. If any of the ladies or gentlemen of Australia think we are trifling, only let them go and see for themselves. The library of the Ex-Colonial Secretary [Frederick Goulburn], containing at least 1000 volumes, is to be sold at an early day by Mr. Paul. By such means as these literature becomes diffused throughout our infant empire; and, in the lapse of a few ages, we promise to become as wise (aye and as learned), as most nations. Mr. JOHN RUSH MOORE; Assistant Superintendent of His Majesty's Hulk Phoenix, to act as Superintendent of Carters' Barracks, in the Room of Mr. PAUL, resigned. BANK OF AUSTRALIA. THE COMMITTEE request, that a GENERAL MEETING of the PROPRIETORS of the above BANK, be held at the House of Mr. JAMES UNDERWOOD, lately occupied by Mr. PAUL in George-street . . .
Last evening the auctioneering voice of Mr. Paul attracted our attention to the Sydney Hotel. "A going for 1050 pounds," was the cry. Over we went. We saw clergymen, merchants, traders, publicans, &c. &c. &c. some standing, some sitting, some walking, some talking, some eating, some drinking - and a table laid out in Cummings' best style, with choice wines and abundant delicacies, ln astonishment we muttered "why, this is Garraway's in London!" The auctioneer was elevated above the rest of the groupe, and was engaged in knocking down estates by the £1000 touch, and often upwards. Cooper and Levey were there; Captain Cox was there; Mr. Terry was there; Mr. Balcombe was there; Mr. Jones was there; Mr. Marsden was there; and we know not who was not there; but, above all men in the world, Captain Piper was there, and seemed wonderfully interested in Mr. Paul's vociferations. We all know the worthy Naval Officer to be one of our very best Colonists, but we certainly did begin to think, what with seeing him in the morning at the sale of the horses, and in the evening at the Australian Garraway's, that he was rather a deep one, and none rejoices more at such a discovery, that is if our surmises be correct - but mum's the word. Some of the lookers-on so much liked the fare, that they remained as long as they could - and walked off at last, wishing success to Cummings, and to Paul, and to all the rest of them. MR. PAUL has taken one of the new houses recently built by Sir John Jamison, in George-street. A shop in the true London style was opened on Monday Morning, and a most elegant and extensive assortment of goods per the Doncaster and Sydney Packet, have been presented to the notice of those Ladies who still retain their penchant for Shopping. Mr. and Mrs. Paul gave a splendid entertainment to their numerous friends yesterday evening. Nearly one hundred Cards were issued on the occasion. The Party assembled in celebration of a Christening. After Tea ---there was a Concert---after the Concert---came a Dance---after dance a Supper---afrer supper another Dance, and then---day light appeared. Six of the Band of the Buffs were engaged. Mr. and Mrs. PAUL, of George-street, entertained a very large party of their numerous friends yesterday evening, at their new residence, which has only lately been taken possession of. The ladies in the ball-room exhibited no small share of taste and adornment, as well artificial as natural. The supper was truly irresistible - the delicacies and wines being abundant and various. Supper being over, dancing was renewed and kept up, till the morning star gave the signal that it was time to part - in order to meet again. The Lieutenant Governor has signified his desire to become a subscriber to the Amateur Concert. In a letter to that effect, addressed to the Secretary of the Acting Committee, His Honor assigns the premature dissolution of Lieutenant Woods, as the sole cause of his not being present at the Concert, on last Wednesday evening. Mrs. Paul's private concert, which we but cursorily noticed last week, was one of peculiar attraction; and both in concert and ball-room, the muses and graces mingled together most harmoniously. Private concerts, are in this sequestered land, in this semi-metropolis, Sydney, a novel innovation on the amusements of an evening. They are however, a pardonable, a delightful innovation, where such natural powers of voice, and so perfect a knowledge of music can be brought together, as the lady to whom we allude, and who is perhaps the first within the Colony, that has led the way toward so elegant and refined a species of entertainment, is gifted with. The enlivening contre-danse was for some time superseded by the treat which Mrs. Paul afforded her numerous fair female and male visitants, in the performance of several different pieces and accompaniments on the piano-forte. Among other delightful airs, "Home, sweet home" was given, with those touching tones of sweetness and expression which thrill to the heart, which irresistibly, may be said to "take the prisoned soul and wrap it in Elysium" - tones peculiar to a Madame Vestris, Catalani, or our English vocalist, Miss Stephens. 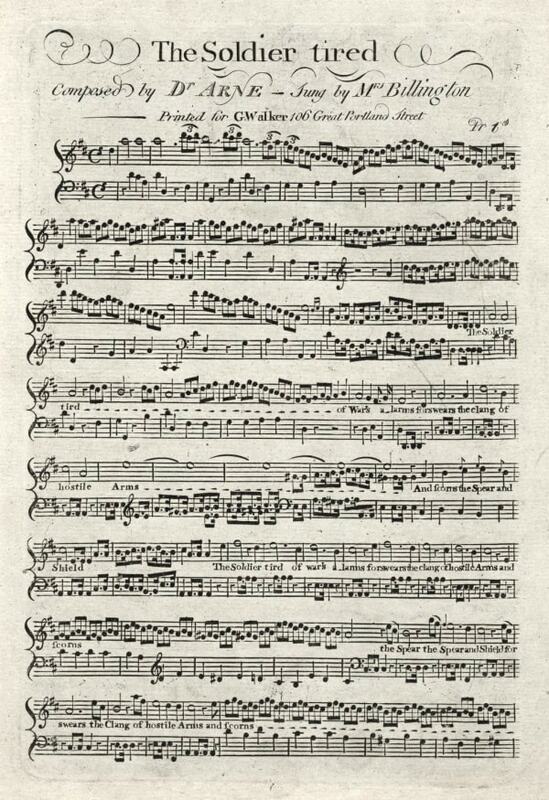 "The soldier tired," with its difficult and rapid passages, its alternate swells and cadinces [sic] was sung and played over with the same ease and success as the other pieces. There were other songs by gentlemen, comic and sentimental songs, which made a pleasing and diverting demele. The room was extremely well calculated for the purposes of a music-room, and the light and graceful manner of its decorations, as well as of the ball room, showed that the proprietor's taste for music did not exclude a taste for the other elegancies of life. Five of the Buffs' band attended in the ball-room in a neatly fitted-up orchestra, and contre-dancing, which was only interrupted for a short time by a visit to the supper room, was kept up with spirit by fifteen to twenty couples, to an early hour of Saturday morning, when the company by degrees took leave of their courteous host and hostess. Mr. and Mrs. B. Levey intend celebrating the christening of their first child, by a ball on Tuesday next. They intend having it at the Free Mason's Tavern. One hundred invitations are to be issued. A CORRESPONDENT WRITES: ON Friday last, Mr. Paul entertained a large party of friends at his new residence in George-street. There were we calculate, about sixty present. Music, and Singing, and Dancing, were the order of the night. Good humour and happiness were universally predominant, owing to the real welcome, unostentatious liberality, and old English cheer, with which the guests were treated. We much rejoice to see the respectable inhabitants of Sydney, thus enjoying themselves; we rejoice that the big wigs are not the only persons in New South Wales, who are able to discuss the merits of a well loaded table, and can trip it in the ball room on the light fantastic toe; we rejoice that the impotent folks, yclept "The Exclusionists," are not the only persons who can live in the style and adopt the manners of gentlemen. Not that we would infer that the Exclusionists are definitively gentlemen - for our experience would induce us to be somewhat sceptical on this point. But let that pass - at least, for the present. - We shall some day or other define the meaning of the epithet gentleman, - and then see whether it be applicable to many who claim it as their own peculiar title - THE company did not break up at Mr. Pauls, 'till four o'Clock A. M.
ON Wednesday Evening about four hundred persons of both sexes assembled at the public School Room in Castlereagh-street, to listen to the musical selections of our Amateur performers of our new monthly Concert . . . Directors for the Evening. Mr. Earle. Mr. J. Paul, jun. Mr. Jos. Underwood. Mr. Hayes . . . The comic song of Mr. Paul, was sung by that gentleman with great ease of manner, and proved what he could do with a song really humourous. Comic songs are of two kinds. One, where combinations of words, vulgar and grotesque, are put together to make a chattering kind of melody, without sentiment or music: and the other, where ludicrous incidents belonging to low life, and the eccentricities of unusual characters are brought into view, coupled with a good strain of merry melody. Of the first description was Mr. Paul's song - of the last, was Mr. B. Levy's. Mr. Paul's was encored because of the ease and grace with which he delivered it - Mr. Levy's, for the real humour of the song itself, managed as it was by capital ventriloquist mimicry. The facts produced by the latter song were from real life. It was a piece of history of low life, full of grotesque images and combinations. As a description of vulgar life, clothed in rhyme and music, such compositions have certainly a tendency to make men merry. As moralists, however, we consider it an injudicious employment of time. At all events, we trust nothing bordering on the profane, or on libertinism, but that real humour bottomed on innocent facts, will continue to distinguish the comic songs. - The recitative and air, merely proved that Mr. Levy has better vocal powers than we had imagined, but we condemn this part of the selection. Without other aid, the audience could not possibly understand the scope of the piece. The reiteration of "one o'clock," too, (the words being very unmelodious,) had an unpleasant, not to say ludicrous effect: for the bon vivants of the company, who were too distant to ascertain what it was all about, conceived that one o'clock was a much better time for lunch than for murder - if the author had talked of "midnight," we might have better understood his drift . . .
To good and bad luck, and mishaps of all kind,"
was received with a warmth and heartiness which must have been as gratifying to their feelings, as it was complimentary to their talents. Their friends mustered strong. LINES. OCCASIONED BY HEARING "HOME, SWEET HOME," SUNG BY A LADY. My hopeless grief nor ought such loss replace. On what I lost, what still I love so well? That "Home" alone, where earthly sorrows cease. Mr. Paul and Mr. Levey executed two comic songs in such good style, as to be received with raptures. In these raptures, however, we could not join. A theatre and a concert are diverse, and we think it scarcely candid to intrench on the character of the latter by pantomine [sic] and farce. However the stream is against us and we cannot stem it. We will not, however, be carried down by it, but edge aside into a neutral bay.
. . . IT being generally understood that Mrs. Paul had most obligingly enrolled her name among the Vocalists of the Evening, an unusual interest was excited . . . Mr. Edwards' performances, especially his Solos, are invariably received; we say his Solos because in our judgment his voice is not altogether adapted for an accompaniment to a Lady's voice - and this was particularly observable in a Duet, "The Butterfly," with Mrs. Paul; a pretty piece and otherwise delightfully sung. The melodious strains warbled forth by this lady captivated every hearer, and were deservedly encored . . . Mrs. Paul concluded her varied performance with "The Soldier tired of War's Alarms." Every note of the gamut was run over with delightful rapidity and quite enraptured the Amateur hearers . . . A Comic Song by Mr. Paul, and "God save the King" closed the Evening's Amusement . . .
LINES ON HEARING A LADY SING "THE SOLDIER TIRED OF WAR'S ALARMS."
. . . Mrs. Paul next assumed her seat at the pianoforte; it would be needless to dilate on the universal and "deserved acclaim" with which this lady's presence was greeted, or on the elegant and scientific manner of her joining with Mr. Edwards, in the duet, "Gay being born to flutter through the day" . . . "Home, sweet home," was next sung and accompanied enchantingly by the same lady who pleased so justly and universally in the former duet, and subsequently in that elegantly varied and most difficult piece of music - "The soldier tired" - both were heard with a flattering degree of admiration, and encored. We shall not try to delineate their several striking excellencies. To gild refined gold, or paint the lilly."
. . . The Evening's Entertainment commenced with the Overture to Lodoiska, which went off in grand style. A Minstrel once by Mr. Edwards, and The Butterfly by that gentleman, and Mrs. Paul, were sung with much effect . . . . Mrs. Paul sung Home, sweet home, with such sweetness, taste, and pathos, that she communicated a thrilling rapture to the whole of the audience.
. . . The Soldier tired, by Mrs. Paul, exceeded every thing that was performed during the evening. The powers of this lady are of no ordinary kind, and it would be difficult to say whether her vocal abilities, or her performance on the piano, at which she presided during the whole of her singing, were entitled to the greatest praise; this bravura was pretty loudly encored.
. . . Mr. Paul sang The merry little Soldier with great spirit, and the Evening's Entertainments concluded with the grand national air of God save the King, when the Company departed to their respective homes much gratified with their entertainment.
. . . The second [part] commenced shortly after with Rossini's overture to Tancredi. It was exceedingly well performed. Mr. Edwards led with the violin, in a very masterly style. An amateur, Mr. J. Paul, played the tenor very creditably. Mr. Sippe's violoncello chimed in with its full soft base, most harmoniously. A pupil of Mr. S. [Joshua Frey Josephson] performed on the concert flute. He filled up pauses among the other instruments, and warbled over the most rapid passages and cadences in such a brilliant, clear, and plaintive manner, as to excite general acclamation. His instructor deserves credit and support. Mr. G. Paul sung "Sweet Kitty Clover" with considerable humour and justness. "The Death of Nelson," sung by Mr. B. Levey, and a comic song by Mr. G. Paul, closed the first act. Mr. PAUL, the Appraiser in George-street, who occupies a moiety of the elegant building lately erected by the wealthy Knight of Regent Ville, has purchased the adjoining allotment of ground to the Lumber-yard, next to the new Warehouse occupied by Mr. Ferris, and intends running up a mercantile edifice forthwith. That side of the street is worth 50 per cent. more than the west side. UNDER THE PATRONAGE OF THEIR EXCELLENCIES THE GOVERNOR IN CHIEF AND MRS. DARLING. AMATEUR CONCERT. In Aid of the Funds of the Benevolent Society. THE Gentlemen composing the Committee of the Sydney Amateur Concert, beg to inform the Public that a Concert will be held on Monday, the 4th of December next, at the Court House, Castlereagh Street. Several of the magistrates, and other gentlemen of the Colony, having expressed their wish to the Committees that such should take place, and having promised their support on the occasion, it is hoped that the Public will give every encouragement to promote an attempt to relieve the above laudable institution. Tickets, 10s. each, may be had on application to Messrs. James Foster, (at Mr. Norton's Office, Elizabeth Street) Earle, Edwards, Foxall, George Paul, John Paul Jun, Rapsey, Roberts, B. Levey, and Sippe, George Street. A full account of the Performance will be inserted in the next week's papers. Mr. FOXALL, 10, George Street. Mrs. Paul has, in the handsomest manner, offered her powerful aid at the approaching Concert for the Benevolent Society. A Gentleman too, of whom report speaks highly as a vocalist, residing, we believe, in Campbell Town, will also afford his assistance; and when the constellation of talent, which is combined amongst the regular Members of the Amateur Concert, all of whom lend their support on the occasion, is remembered, a more than usually excellent musical treat, may very fairly be anticipated. MRS. BODENHAM, a lady very recently from Europe, occupied the southern portion of Sir JOHN JAMISON'S new buildings in George-street, adjoining the present residence of Mr. Paul. Mrs. B. is on the eve of opening these fine rooms with a most captivating and richer display of assorted MILINERY that ever left London for any foreign shore. The Ladies of Colony will find this new warehouse, as it will be conducted upon principles entirely after the London style, amply entitled lo their distinguished patronage; and we have little doubt that the engaging manners of the lady who conducts this nouvelle establishment - one so much needed in this increasingly fashionable part of the globe - will eusure the most fortunate success. EXTENSIVE preparations are making for the accomodation [sic] of His Excellency the Governor and suite, the Honourable. Mr. Mc Leay and family and a dignified circle of fashionables, who intend honouring the next Amateur Concert with their presence. The following is the cast of songs. - Glee "Ye mariners of England" by Mrs. Paul and Messrs. Edwards and Clarke - "Flow thou regal purple Streams," Mr. Edwards; " When thy bosom heaves the sigh" Mrs. Paul, and Messrs. Scarr and Edwards; "The Storm" Mr. Levey; "Bid me discourse," Mrs. Paul; "The Chough and crow," Mrs. Paul, and Messrs. Scarr and Edwards; " I ne'er will cease to love," Mr. Clarke; "The soldier tired," Mrs. Paul; " Our country is our ship," Mr. Levey ; "Hark the lark," Mrs. Paul; and Messrs. Edwards, Clarke, and Scarr; "Eagle wings the clouds impelling," Mrs. Paul, and Mr. Edwards. We understand, in addition to the beautiful selection of music advertised for Monday evening's concert, for the benefit of the Benevolent Institution, Mrs. Paul has been particularly requested to sing the much admired ballad of Cherry Ripe, sung by Madame Vestris with universal applause. The Concert, on Monday evening next, in aid of the funds of the Benevolent Society, promises to present a more than usually rich treat. The selections for the occasion are of a more varied description than those of any previous evening; and the number of songs, &c. allotted to Mrs. Paul, who has so handsomely volunteered her services, should, and we have little doubt will, even were there not a charitable inducement, draw together a large assemblage of rank and fashion to listen to the mellifluous strains of the Catalani of Australia. The Concert on Monday evening, in aid of the Funds of the Benevolent Institution, was as numerously and as flatteringly attended as the most sanguine friends of the Institution could possibly hope for. Mrs. Paul was a great point of attraction during the evening; her songs were followed with loud plaudits by the audience . . . The entire performance was not over before 12 o'clock. The company were much more numerous than on any former Concert. There were present, Mrs. Darling, Mrs. McLeay, &c. the Misses McLeays, &c. and Chief Justice Forbes; Colonels, Shadforth and Mills; Captains, Dumaresq, Piper, and Gillman, &c. &c. &c.
Mrs. Paul was the great attraction of the evening, and certainly fully sustained that fame she has so justly acquired. Her songs "Bid me discourse," the "Soldier tired," and a pretty ballad called "Cherry ripe," all of which were rapturously encored, were given in a superior style of excellence that was not a little heightened by the scientific manner in which they were accompanied by the lady herself on the piano-forte . . . A Mr. Scarr appeared this evening for the first time. His voice is not devoid of sweetness, nor uncultivated, but it wants the softness of Mr. Clark's tones, for which reason, we think, the parts sustained in the glees by the former, would have been more effectively performed by the latter gentleman, whose voice, in our opinion, would have harmonized better with those of Mrs. Paul and Mr. Edwards.
. . . Mrs. Paul took a leading part in every duet. A very popular air now singing in London by Madame Vestris, "Cherry Ripe," was rapturously encored, as was a pathetic ballad "Oh Rosa, when you quit the spot," in which the protege of public favour, Mr. Clarke, came off with distinguished eclat. Mr. Scarr, an amateur of talent, acquitted himself respectably; and "Flow thou regal purple stream," gave Mr. Edwards scope for the display of his superior science. Mr. and Mrs. Paul, sen. positively intend leaving the Colony for Europe, in January, or by the first ship after the Elizabeth, which will sail next month. AUCTIONEERING seems to be the best business going at present. We heard some time ago, of Mr. and Mrs. Paul going to Europe to enjoy some of the fruits of their industry. But from the great run of business Mr. P. has on his hands, we suppose that he cannot prevail upon himself to quit a shore for the present, on which he has acquired so handsome an independency, and in which fortune still continues to shower upon him its gifts. However Mr. Paul's new and elegant Auction Mart is likely to be well supported by his sons, whenever Mr. P. retires to England, whether it be to remain there to act as shipper for them, or to return in due time to spend the evening of life in the Colony. Mrs. Paul will be missed by her musical friends. We have always regretted that this lady's musical science, vocal as well as instrumental, has been confined to so private a circle. Those who remember her performance at the Amateur Concerts, are still desirous to re-establish those innocent sources of public recreation. We are happy to hear that the old building which was formerly in the occupation of Mr. Paul, and which disfigures George-street, is at length doomed to be removed. It will be rased to the ground in March next, for the purpose of widening the street . . .
MR. PAUL it is said, took home with him £10,000 in hard cash and bills. Mr. and Mrs. PAUL, whose return to Europe we ought some time since to have mentioned, took home with them, in cash alone, £10,000. The Elizabeth, Captain Collins, which sailed from this port, now near twelve months ago, by accounts received in the Colony had reached England safe. By this vessel, it will be recollected, Mr. Paul, sen and family, proceeded as passengers. Another cricket match was played off on in a paddock, a short way out of town. Among the batmen might be observed Messrs. Spyer, Paul, Levey, Mitchell, &c.
It is currently reported about Sydney that the ship Surrey has arrived at Hobart Town, having on board our old and respected townspeople, Mr. and Mrs. Paul, sen.; - but not being able to trace the rumour to an authentic source, we have our doubts upon the subject. Arrived, yesterday, Sunday, the barque Surry, Captain Dacre, from London, on the 15th February, and Hobart Town the 13th instant. Lading, merchandize. Passengers, Dr. Bennett, Mr. Paul, Mrs. Paul . . .
For Sale. An Excellent toned cabinet Piano-forte with additional keys. ALSO, A Double Bass, Violencellos [sic], Tenors, Violins, And a variety of printed music for the above instruments, At JOHN PAUL'S, George-street. To THE EDITOR OF THE SYDNEY MONITOR. THE SERAPHINE. Sir, Observing in one of your late papers an account of a new musical instrument called the Seraphine; I had the curiosity to call at Mr. Paul's to see it. I was not only surprised but delighted with it. The tones of the Seraphine are of very different qualities; the lower notes resemble those of the bassoon, the middle, those of the horn, and the upper, those of the hautboy. From its grave character, it appears peculiarly adapted for the performance of Church music. Any music in the Cantabile style, can be given with great effect. In my humble opinion it is capable of much expression, in the mode of touch as well as by the mechanical means attached to the instrument. I consider it quite powerful enough for the Church of St. Phillip, and sufficient, in proper hands, of leading a choir of singers; it is not however near so loud as the organ of St. James's. We should have a proper opportunity of judging, if the two instruments were placed beside each other. It is however fully adequate for the performance in public, of every kind of Sacred music, and I think will soon be used in all the small Churches and Chapels in England. With an organ front, few persons could distinguish it from that superb instrument. I am Sir, Your Obt., JAMES PEARSON. ARRIVALS. From London, via Hobart Town, on Thursday last, having left the former place the 25th of October, and the latter the 13th instant, the ship Gulnare, Captain Bully, with a general cargo. Passengers, Mr. Isaac Bird, Mrs. Bird, and 4 children . . .
SIR, You, as well as the editor of the Monitor, who have witnessed the extraordinary exertions and struggles of poor Levey, in raising a theatre, which he has effected beyond the most sanguine expectations of all, have seen him through these efforts, brought to the very door of the gaol, yet, will interfere in the squabbles between him and his discarded servants, who have displayed more ingratitude than would have been permitted or even noticed by London Editors. What are those adventurers? mere strolling players, on their way to the next town, engaged to Mr. Dean (if the papers be correct), which Mr. Levey does not repine at. I have never yet been to see a play at Sydney, having seen too many in London, to convince me that Mr. L. must be content to move by degrees with a willing and forbearing audience. Rome was not built in a day, and Messrs. Levey and Simmons must patiently wait for sometime before they can command performers of talented character. A few years will, no doubt, remedy this defect . . . Being always delighted with a good concert, I attended the first given at the Pulteney Hotel, and regret that splendid building was not honoured with all the best vocal and musical talent in the colony, to give eclat to the thing. I believe Mrs. Taylor's attempt, at Hobart Town, was not successful in concert singing; her little ballads are very pretty, but only suited to the parts of the play, wherewith her science in music might answer as a second rate Opera singer. I recollect our worthy colonist, Mrs. Paul, favouring the Subscription Committee of 1826", with Angels ever bright and fair and The soldier tired, the music conducted by Mr. Edwards, whose manly songs, came somewhat near the mark. I believe a Mrs. Bird in this colony well calculated to sing at concerts. The audience was thinly attended, but rather respectable. Remaining yours, CASTIGATOR, 24th April, 1834. SINGING & PIANOFORTE INSTRUCTION. 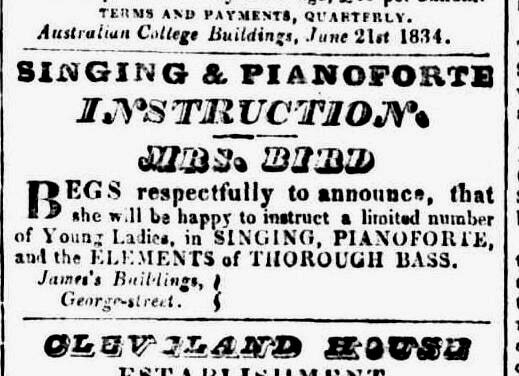 MRS. BIRD BEGS respectfully to announce, that she will be happy to instruct a limited number of Young Ladies, in SINGING, PIANOFORTE, and the ELEMENTS of THOROUGH BASS. James's Buildings, George-street. We are glad to learn that another series of Concerts, to be got up under the management of some of the originators of the first Sydney Amateur Concerts, will shortly be given at the Pulteney Hotel. Among the vocal performers are enumerated Mrs. Bird, of whose talent as a singer report speaks highly, and Mrs. Paul, whose powers are already well known not only to many of her private friends, but also to those who have had the very great pleasure of hearing her at the Amateur Concerts some years ago. We learn from good authority that Mrs. Bird of George-street, purposes in a short time to give a treat to the musical amatures of Sydney, in which she will most probably be assisted by her mother Mrs. Paul, whose acquirements in this delightful science are so well known, and so highly appreciated by the public. It will be seen in our advertising columns, that Mrs. Bird announces a Concert on Tuesday next, at the Pulteney Hotel, which we doubt not will be well attended, particularly as we understand Mrs. Paul intends to give her powerful aid to her daughter. PUBLIC CONCERT. MRS. BIRD respectfully announces her intention to hold A CONCERT At the PULTENEY HOTEL, on TUESDAY EVENING next, the 19th. instant, upon which occasion will be combined the assistance of the Principal professors and Amateurs of Music in Sydney. Also, by the kind permission of Colonel Despard, the BAND of the 17th Regiment. Conductor, MR. LEWIS. Leader, MR. WILSON. The Performance to commence at Eight o'Clock precisely. TICKETS - PRICE 7s. 6d., To be had at Mr. Ellard's Music Saloon, Hunter-street, and Mr. Evans's Library, Bridge-street, where a programme of the Concert may be obtained. but, really, whether the lady in the pink body, or the charming girl in the blue robe, drew the most attention from the music, we will not now undertake to decide. The latter, we think - but no; we will not pronounce, but leave the ladies to guess. Altogether it was a very pleasant evening; and although the company was not so numerous as we wish it had been, we hope that Mrs. Bird will give more concerts, when her friends, and the lovers of music, we are sure, will muster stronger. We heard some gentlemen in the room express regret at not hearing Mrs Taylor. We believe that her assistance was not asked; for we think we may assert for her that if it had been, she would not have withheld it.
. . . Mr. Lewis promised to introduce at his Concert all the vocal talent of Sydney. Where were Mrs. Ellard, Mrs. Bird, Mrs. Jones, and Mrs. Boatwright? In lieu of these, Mrs. Child was or the first time introduced to a Sydney audience . . .
[Concert program] . . . 10. Extemporaneous Performance on the Pianoforte on any subject or subjects which maybe presented (written). Mr. Wallace . . . It affords us great pleasure to state that the second Concert given by Mr. Wallace, on Friday evening last, was a triumphant one, both as to performance and attendance. The room was crowded to an excess . . . Mr. Wallace was presented with various pieces of music, which he played extemporaneously, introducing occasionally some brilliant variations, which excited much general astonishment. He ended that performance with " Currency Lasses" (as composed by our talented towns lady, Mrs. John Paul senior,) adding to it some extemporaneous variations, many ladies and gentlemen were to be seen with scraps of music in their hands ready to present them, but being so well satisfied, no doubt did not wish to trouble him . . . DEPARTURES. Yesterday . . . the ship Spartan, Bull, master, for Liverpool, with colonial produce. Passengers, Mr. and Mrs. Paul, sen., and two children . . .
MARRIED. By Special License, on the 20ih instant, at St. Lawrence Church, by the Rev. W. H. Walsh, Mr. Rich, to Isabella Tempest, relict of Mr. Isaac Bird. DIED . . . On the 20th instant, Isabella Tempest, wife of John Rich, Esq., of Fitzroy Crescent, Hobart Town. DIED . . . At his residence, Pyrmont, on the 21st instant, Mr. George Paul, aged 49 years, much respected by all who knew him. 4 Manchester Street, Brighton Sussex; Head William & Lucy Wick. . . visitors . . . John Paul, aged 77, gentleman, born Wakefield, Yorkshire; Tempest Paul aged 70, born St Marylebone, Middlesex. 8 visitors plus servants [? a lodging house]. On the 25th inst., at Kelstone, Millbrook, Southampton, Mrs. Tempest Margaret Paul, relict of the late John Paul, Esq., formerly of Sydney, New South Wales, aged 76. This is the last will & testament of me Margaret Tempest Paul of Regents Park in the parish of Millbrook co. Southampton widow I bequeath to my granddaughter Sarah Charlotte the wife of Charles Capon Durham my gold . . . ing brooch my . . . diamond ring my pearl and emerald ring and my gold diamond and emerald ring. I give to William Blake Lambert the husband of my grandaughter Margaret Isabella Lambert, all the wearing apparel and all the plate and plated goods and the . . . jewellery, trinkets and and ornaments of the person . . . disposed of . . . respectively I shall be possessed I give to each of my friends the said Charles Capon Durham, William Clarke Esquire and Fanny Harrer widow ten pounds for a mourning ring I give the following other percuniary legacies. To my granddaughter the said Sarah Charlotte Durham three hundred and fifty pounds to Tempest Isabella Lambert the daughter of the said Margaret Isabella Lambert two hundred pounds which two legacies shall be paid free from legacy duty which duty shall be paid out of my residuary personal estate to my friend S . . . Richard Withers fifty pounds to Archibald Walker of number 10 Bishopgate Street . . . Esquire and Charlotte Dalton of Sydney NSW spinster nineteen pounds nineteen shillings . . . Neagle widow if she shall survive me but if not to her son William Neagle one hundred and fifty pounds I give all my real estate and all the residue of my personal estate unto the said William Blake Lambert his heirs executors and administrators absolutely I appoint the said William Blake Lambert and Archibald Walker executors of my will . . . whereof I have set my hand and seal 22 Nov 1855 T M Paul. Witness Thomas Goaser solicitor Southampton, A.B. Rundell, J. Bloomfield his clerks. Marginal entry: my gold watch and chain I give to my said granddaughter Margaret Isabella. 1855, Hanover Lodge Shirley Hampshire. Family and architectural historian Jill Barker has kindly shared her research findings on later generations of the Paul family, including several other active musicians and composers. A son of George Paul, George William Paul (1839-1909), born in Penrith, was a judge of the Queensland district court from 1874 until his death. His eldest son, Arthur Edmund Paul (1862-1909), composed the Australian star waltz to mark the 1901 royal visit to Australia, and had it published in London by J. B. Cramer & Co.. No copy appears in the Australian bibliographic record, but there is a copy at the British Library. NEW MUSIC. Of the latest musical compositions sent to us for review, the "Australian Star Waltz" is perhaps the best. It opens with thirty-six bars of introduction, the Allegro Brilliante movement being very effective, and one is prepared for something really good. The waltz proper very dreamy and melodious, and the time is well marked. It also displays originality, which is unusual in most of the waltzes of to-day. The "Australian Star Waltz" should certainly become very popular here, both at private and public balls. It has been arranged for either full orchestra or septet. It is interesting to know that the composer is Dr. Arthur E. Paul, son of Mr. Justice Paul. The waltz was composed in commemoration of the Royal visit to Australia, and is published by Cramer, London. Their son, clarinettist Peter Kyng (d.2009) was bass clarinettist of the Sydney Symphony Orchestra from 1960 to 1983, and a long-serving offical of the Musicians' Union (NSW Branch). Jill Barker, "Judge George W. Paul's Japanese house: a case study", in Antony Moulis and Deborah Van Der Plaat (eds. ), Proceedings of the XXVIIIth International Conference of the Society of Architectural Historians, Australia and New Zealand, The Society of Architectural Historians, Australia and New Zealand (SAHANZ), State Library of Queensland, Brisbane, QLD, 1-15.